So, you no doubt remember that when we reviewed Growing Rites of Itlimoc and Itlimoc, Cradle of the Sun, I had a whole little song and dance about how they reprinted Gaea’s Cradle. If this is your first time reading the original’s game text, take a moment and think about just a couple of the reasons why it still holds up so well that I would have a whole little song and dance about Itlimoc. This requires no setup – just play it and tap it right away, if you need to, for just a hundred or so mana. Green has a lot of creatures that generate mana themselves – they’ve backed away from this in recent Standard sets, but Urza’s Saga‘s environment had several different ones. An innocuous Llanowar Elves or two lets you Fireball for about a thousand damage in one or two turns. As thrilling as it might feel now that Itlimoc more or less violates the spirit of the Reserved List, often there really is nothing like the original. This card is nostalgic for me as it was one of the first cards I played against. Not only did I lose horribly but it left me with an impression of just how good those boring land cards could be. Whether you are going tall or wide, Gaea’s Cradle will help you with a flood of mana. This card is practically synonymous with Elf decks. This card doesn’t even come into play tapped! The only downside is that since it is legendary and a dud on turn 1 99% of the time, running a full playset is risky. If you are building a green deck that is allowed to play this card, go for it. Gaea’s Cradle…is busted. Not sure what else to say here. Part of the Bant-colored trio of lands that massively accelerate resources, Gaea’s Cradle has forever found a home in Elf tribal decks, thanks to how much green mana it produces. With the inherent low cost of most Elves, it’s not unheard of to have Gaea’s Cradle start generating 4 or 5 mana on turn 3. Of course, it’s useless outside of creature decks, but that’s a limitation you can work around, right? 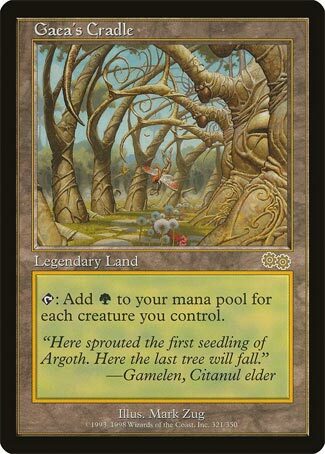 Lands that produce more than one mana have historically been very dangerous, and Gaea’s Cradle certainly is that. It functions well with untap effects, it’s the engine behind one of Legacy’s most formidable decks, and it does it all for a sticker price that’s higher than my brother’s receding hairline. Don’t let this stick around, or you’ll regret it.